Donald Trump has had one of the quickest rises and falls in the history of Presidential politics. Last month we found him leading the Republican field with 26%. In the space of just four weeks he’s dropped all the way down to 8%, putting him in a tie for fifth place with Ron Paul. As Trump got more and more exposure over the last month Republicans didn’t just decide they weren’t interested in having him as their nominee- they also decided they flat don’t like him. Only 34% of GOP voters now have a favorable opinion of Trump to 53% who view him in a negative light. Trump really made hay out of the ‘birther’ issue and as the resonance of that has declined, so has his standing. In February we found that 51% of Republican primary voters thought Barack Obama was not born in the United States. Now with the release of his birth certificate only 34% of GOP partisans fall into that camp, and Trump’s only in fifth place with that now smaller group of the electorate at 9%. And his tv ratings took a hit also. Embedding isn’t allowed so you’re gonna have to go here to watch how Nigerian filmmakers improved upon James Cameron’s Titanic. 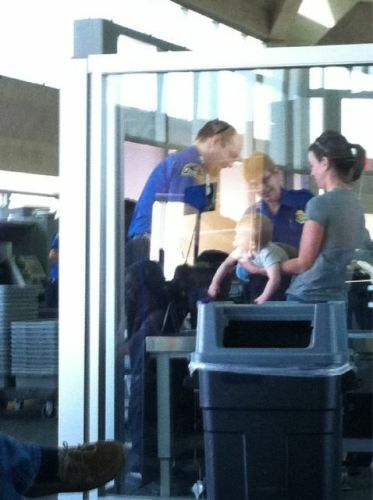 A picture of Transportation Security Administration agents patting down an 8-month-old baby at Kansas City International Airport has sparked controversy over what constitutes an actual terror threat on airplanes.